Shaun Usher, Lists of Note, Canongate Unbound, 2014. They can be the only way to get through the working day, essential for the supermarket run or a way to rank the best books of the year. Lists might sound prosaic, but the manner by which they order every part of our lives makes their authors intriguing, too. 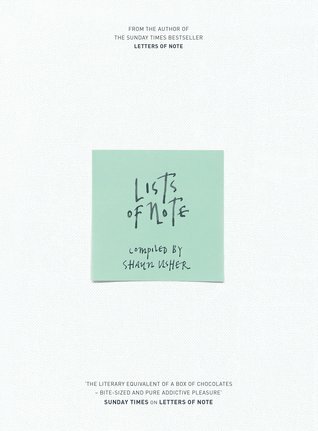 As Shaun Usher says in this swift follow-up to his equally engrossing Letters of Note, a world without lists would be a chaotic existence, a “world full of things, muddled and overflowing, without a sense of purpose or collective identity”.Of course, some lists are more interesting than others. Your list of new year’s resolutions might be fairly predictable, but Marilyn Monroe’s concluded with the achingly sad “try to enjoy myself when I can – I’ll be miserable enough as it is”. And while there is an inevitable emphasis on celebrity in Lists of Note - Kurt Cobain’s wishlist for the Smells Like Teen Spirit video is as revealing as Roald Dahl’s dictionary of new vocabulary (gobblefunk) for The BFG – Usher succeeds in teasing out normality in the 125 he picks. Kurt Vonnegut’s faux marriage contract from 1947, when his wife was pregnant with their first child, has a brilliant henpecked weariness about it: “I will hang up my clothes and put my shoes in the closet when I am not wearing them.” Johnny Cash’s “Things to Do Today” has “Kiss June” swiftly followed by “Not kiss anyone else”. Cash’s is the very first list, and within the next few pages all human life becomes apparent. There’s a ledger of George Washington’s slaves, Benjamin Franklin’s Drinker’s Dictionary (from “addled” to “very weary”), a shopping list by a 10th-century Tibetan monk (“one skin of wolf-hide for blankets”) and a list of suspects from JFK’s secretary, Evelyn Lincoln, written just hours after the president’s assassination: Lyndon B Johnson ranks just above the Ku Klux Klan. This is a beautiful, pricey, oversize book. (At least the copy I have is: it's published by Canongate and Unbound in the UK. I haven't seen the US edition.) It has lists made by a wide variety of people, from Robert Boyle to Susan Sontag, from Sei Shonagon to Noel Coward. Often it's scholarly as well as beautiful: Usher provides transliterations and translations, and the lists are reproduced in high-resolution photographs. Nick Cave's notebook looks like a precious ancient artifact. Some pages reproduce tattered sheets on papyrus and other materials--a shopping list written in Dunhuang, an Egyptian list of the meanings of dreams, a list of worker's absences written on a limestone ostracon. When Usher can't find the originals, he substitutes reproductions and photographs of the authors. Usher is also interested in lists that slightly disrupt our sense of artworks: for that there's Dickens's list of "available names" for characters, a list of alternatives to Rudolph (the red-nosed reindeer), and a list of Disney's alternate names for his Seven Dwarves. But lists have a much more varied history (beyond popular culture and self-help) and there is a different reason for being interested in them now that Usher does not seem to care about. The first problem is historical: what are the histories of the list? And the second is critical. Another history might include lists drawn up by Renaissance humanists. Usher has two entries by Leonardo, but he misses Leonardo's Codex Trivulzianus, which is devoted entirely to lists. Rabelais would be a principal Renaissance source and precedent. Another kind of list, perhaps the most numerous, is the "laundry list"--business lists of trades, prices, employees, food, and so on. There are ancient lists in this book, but they play a minor role and don't fit well with the many entertaining popular culture entries. Ancient lists survive in many archaeological contexts and could have been a book in their own right. And of course academics would always want to include the list Foucault attributes to "a Chinese encyclopedia" in "The Order of Things" (there is a good study of the source of the list, which leads through Borges but is still unidentified). Foucault's list stands in not only for epistemologically disordered lists, but also for surrealist juxtapositions in general. These are random thoughts: I'm not aware of any historical reviews of the concept of the list. There is an essay by William Gass, "I've Got a Little List" (thanks to Dan Weiskopf for alerting me to this; it's in "Salmaundi," 1996), but I do not know any historical treatments. There are hundreds more lists in "Against Expression," and several thousand more on the internet and published as artist's books and with small presses. I don't mean to imply lists like these form a coherent, single movement, although the editors of "Against Expression," Kenny Goldsmith and Craig Dworkin, claim that they do. I think there's some basic work to be done distinguishing lists that have been made by contemporary writers with the intent of avoiding or erasing conventional writerly expressiveness (this is a claim Dworkin and Goldsmith make), and lists that have been made with the intention of recovering genuine expressiveness from the few places where it can still be found, such as dictionaries and apparently impersonal collections (this is a claim both editors also make). "Against Expression" is deeply self-contradictory in its aims, but it is firmly contemporary. "Lists of Note" is genial, beautifully done, and entertaining, but has no special claim on history or the present except for the list's intrinsic power of cutting across cultural contexts. 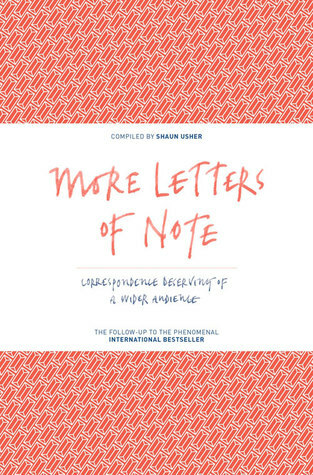 1. Review Shaun Usher's Lists of Note. Mention that Usher's first book was the bestselling collection Letters of Note. 2. Describe book: a list of 125 lists by everyone from Marilyn Monroe to Sir Isaac Newton, Gandhi to Kurt Cobain. Includes a list of JFK's potential assassins by his secretary, Evelyn Lincoln: "Lyndon…KKK…Hoffa…Nixon". 3. Suggest we live in Age of the List. Nerdy, Hornby-esque Top 10s: Best Albums containing the letter G; 40 Places To Twerk Before You Are 40. 4. Give some intriguing Usher examples. Hemingway's must-read books for aspiring novelists: War and Peace, The Great Gatsby, Wuthering Heights; 25-year-old Marilyn Monroe's ideal lovers; rules for writers by Kerouac, Billy Wilder, Henry Miller. 5. Lists are part of the creative process. Walt Disney's other Dwarfs: Biggo-Ego, Biggy, Flabby, Neurtsy. Chandler's list of similes: "Smart as a hole through nothing". Marianne Moore's possible names for Ford cars: Thunderblender, Mongoose Civique, Utopian Turtle-top. 6. Propose that 21st-century culture has made list-makers of us all. Twitter, email, search engines concentrate communication, news, gossip, football matches into lists. Note how lists shape prose style into Txt msg lyricism: dearth of complete sentences, death of definite article, abv-iation. 7. Usher includes writers – Calvino, Borges, Perec, Barthes – who know that lists can tell stories. Example: Perec's knowing account of everything he ate, which makes Karl Ove Knausgaard look forgetful. F Scott Fitzgerald reminds us that recipes are lists: "Turkey cocktail: To one large turkey add one gallon of vermouth…"
8. Some favourite lists. Johnny Cash's witty, moving personal dos and don'ts: "2 Kiss June 3 Not Kiss anyone else…", Swift's "When I come to be Old"; Harry S Truman's list of 38 wedding anniversaries as national and personal history: "June 28, 1947: Marshall Plan…A grand 28th Anniversary"; Edmund Wilson's curmudgeonly Won't Dos sent to pesky correspondents: "Read manuscripts...Judge literary contests…Give interviews…Autograph books for strangers". Usher notes Wilson "was soon inundated with requests for the list itself". 9. Lists of Note: 1. Splendid. 2. Addictive. 3. Sumptuously produced with interesting photos and facsimiles of actual lists. 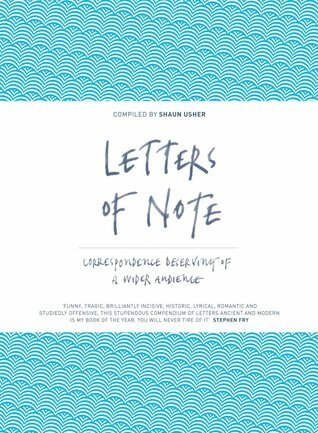 Shaun Usher, Letters of Note: An Eclectic Collection of Correspondence Deserving of a Wider Audience, Chronicle Books, 2014. "Letters of Note is quite literally the most enjoyable volume it is possible to imagine. Every page is a marvel." "The literary equivalent of a box of chocolates — bite-sized and pure addictive pleasure." "There have been many collections of letters before this one, and no doubt there will be many to follow. But it is hard to see how Letters Of Note could ever be surpassed." "...Usher’s compilation is hard to beat." "...deserves to be this Christmas' runaway bestseller." "A truly extraordinary reading experience [...] a mind-boggling, sumptuous hardback." "...a book that entire afternoons will be lost in for years to come." "It's a big, beautiful object. It is also wonderful to read." "...remarkably well compiled [...] a hefty, luxuriously bound and designed work." The photos above are of the book's trade edition in the UK; more can be seen here. Zelda Fitzgerald, Iggy Pop, Fidel Castro, Leonardo da Vinci, Bill Hicks, Anaïs Nin, Fyodor Dostoevsky, Amelia Earhart, Charles Darwin, Roald Dahl, Albert Einstein, Elvis Presley, Dorothy Parker, John F. Kennedy, Groucho Marx, Charles Dickens, Katharine Hepburn, Kurt Vonnegut, Mick Jagger, Steve Martin, Emily Dickinson and many more. Shaun Usher, More Letters of Note: Correspondence Deserving of a Wider Audience, Canongate Unbound, 2017. Jane Austen, Richard Burton, Helen Keller, Alan Turing, Albus Dumbledore, Eleanor Roosevelt, Henry James, Sylvia Plath, John Lennon, Gerald Durrell, Janis Joplin, Mozart, Janis Joplin, Hunter S. Thompson, C. G. Jung, Katherine Mansfield, Marge Simpson, David Bowie, Dorothy Parker, Buckminster Fuller, Beatrix Potter, Che Guevara, Evelyn Waugh, Charlotte Bronte and many more. Discover Richard Burton's farewell note to Elizabeth Taylor, Helen Keller's letter to The New York Symphony Orchestra about 'hearing' their concert through her fingers, the final missives from a doomed Japan Airlines flight in 1985, David Bowie's response to his first piece of fan mail from America and even Albus Dumbledore writing to a reader applying for the position of Defence Against the Dark Arts Professor at Hogwarts.